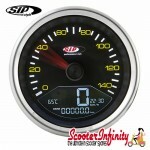 Since its introduction in 2010, the SIP Rev Counter has revolutionised the classic scooter speedometer market. Features, previously requiring the inclusion of extra instrumentation, have now been integrated into its design with maximum understatement. Several years and countless customer requests have culminated in us getting together again with the people at KOSO to develop an update to our first generation SIP Rev counter that we can truly be proud of : The SIP Rev counter/Speedometer 2.0! 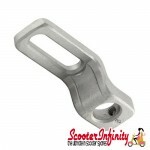 Its outer appearance remains strikingly similar to that of the original item and its additional functions are virtually invisible when not in use. The design of the speedometer face is also largely identical to that of the Italian original with kilometre scaling along with the general dimensions of the unit. 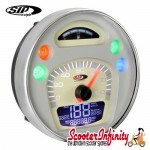 These Speedometers are available with both black and white coloured number face surfacing. In addition, the version available for old-school VBB Vespa models can also be ordered in beige/white, providing an authentic, sun-bleached appearance. 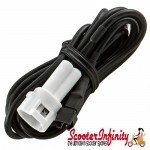 Installation could hardly be simpler and requires no special knowledge. 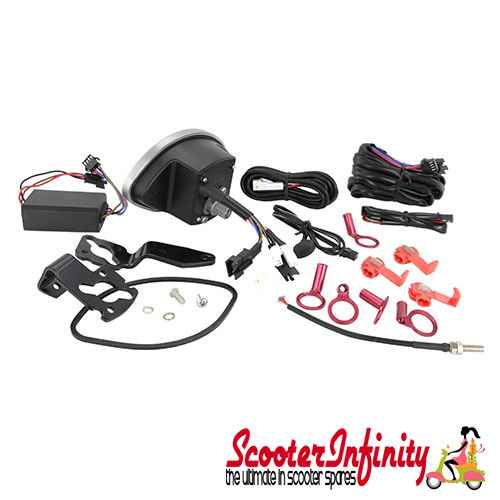 It can measure your speed with the conventional speedometer cable and drive assembly or alternatively with the inclusion of the, separately available, electronic wheel revolution sensor kit. 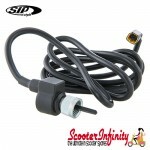 The speedometer function can then no longer be interrupted due to failing speedometer drive worms or cables and in addition its accuracy is also improved. The rpm value is determined through its connection to the light signal supplied by the wiring loom. All data recorded by the device are saved for future reference by an internal storage facility. 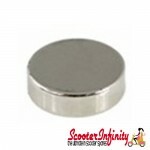 The unit is run on 12V AC/DC and requires no battery in the electrical system of your scooter. 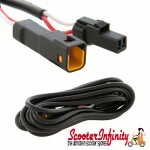 It is also fully compatible with Vespatronic and Parmakit performance ignition systems. 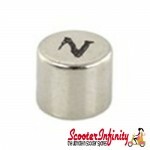 To adjust and scroll through the functions on the electronic display a small button is included, which can be easily and inconspicuously located beneath the scooters existing light switch. A snazzy gimmick: During the ignition sequence the speedometer unit carries out a complete function check, similar to current high-tech GP racing machines. A new feature of the 2.0 version is the choice between an analogue speedometer or rev counter. 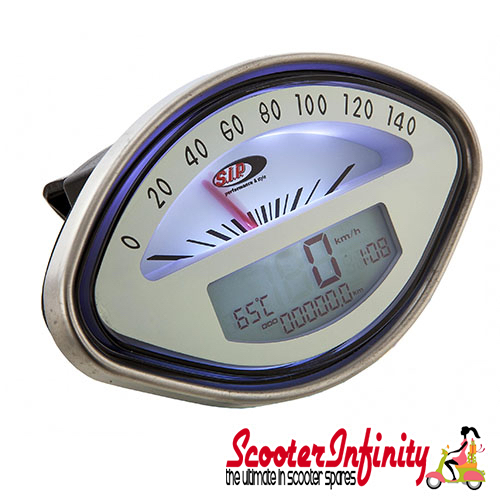 The speedometer needle can be used to display either speed or rpm. During longer trips you can also record the total time of your journey and the average speeds for both daily stages and the whole tour, which can be set up individually. The total number of kilometres travelled, recorded by your original speedometer unit, can also be transferred to the km value displayed. In combination with the SIP fast flow fuel tap, with fuel reserve sensor, all Vespa models can now benefit from a fuel level warning function. To indicate the ebbing level in your fuel tank 'FUEL' starts to blink on the electronic display. 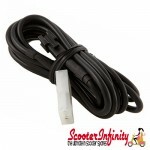 In addition, it also improves the voltage regulation of your complete electrical system. 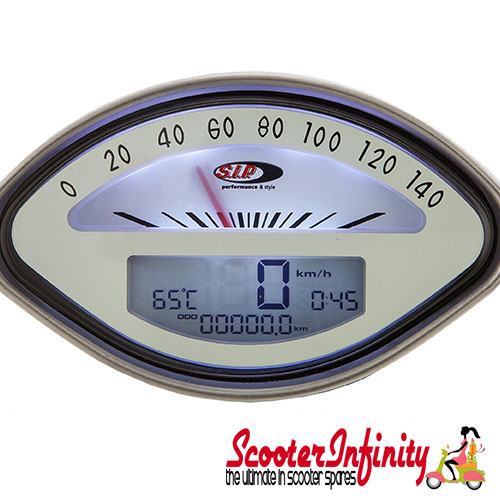 The speed values on the analogue number-face of the SIP Speedometer/Rev-Counter designed for the Vespa smallframe models go up to 80. 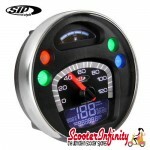 These speedometers are intended for use in Vespa V 50 / PK models that rarely reach higher speeds or engine revolutions. Now, at last, we can provide a high-tech alternative to the more basic reproduction speedometers that are otherwise currently available. Notice: Please use interference suppressed sparkplugs and resistor caps. Conclusion: The first high end cockpit instrument for classic Vespa models that successfully combines a speedometer and a rev counter with an almost completely original looking component. 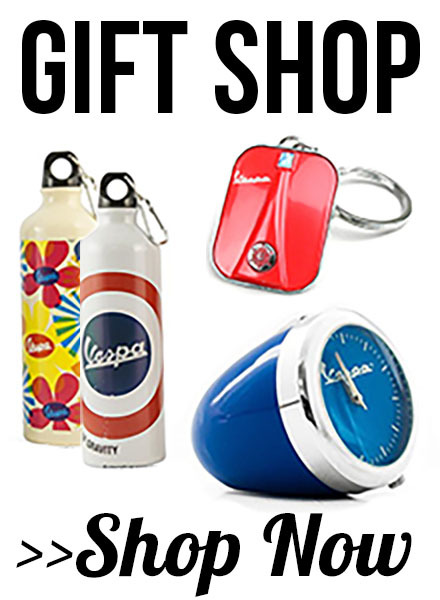 Whether you are a racer, rally goer, tourer or an urban cowboy - it offers advantages to all! • Analogue rev counter up to 12 or 14000 rpm, according to model. • digitally displayed speed: 199 kph or 140 mph. • temperature: 250°C or 32-482°F for cylinder head or cooling water temperature, a temperature sensor for the spark plug is also included in the delivery. 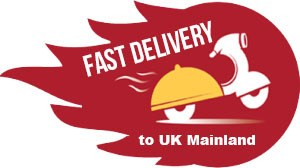 • Maximum total measurable distance travelled: 99999 km or miles. • 'A' and 'B' stage distance extended to 9999,9 km or miles. • 'A' and 'B' stage time 99,59 h.
• average 'A' and 'B' stage speed 199 kph or 140 mph.